The Executive Director of the Lithuanian Clusters Association, the President of Užupis Creative Cluster, the Head of Information Security Cluster, also the founder and director of other clusters Marius Pareščius became international clusters benchmarking expert. On 3rd of March, the European Secretariat for Cluster Analysis (ESCA) located in Germany issued international certificates for cluster experts from Spain, France, Germany, Latvia and Lithuania after intense training. 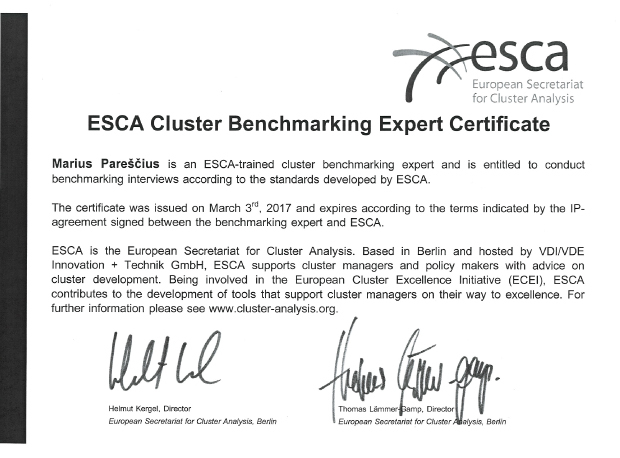 According to the new ESCA clusters benchmarking expert Marius Pareščius, in order to become a certified and acknowledged cluster is not easy, it is a result of meticulous and long-term activity. “System of evaluation created by Germans is tricky and complicated. Three-step certification system (bronze, silver and gold) is based on a large amount of indices and, in order to meet them, it is necessary to work hard for years. If it is not complicated to receive bronze, and almost every active Lithuanian cluster can get this evaluation, not every cluster can be evaluated with silver or gold certificate not only in Lithuania, but also in Europe. Latvians and Estonians already have one Silver Label cluster – it is a challenge for Lithuanian clusters, and I hope that we will attain at least one cluster certified with Silver Label after couple of years”, – claims the expert. It is also highly significant that Marius Pareščius speaks Russian, it opens new opportunities to work in a Russian-speaking region, for instance, to consult or certify newly emerging clusters in the neighboring Ukraine, where clustering currently only accelerates. It is a fine possibility for Lithuanian companies and clusters to implement international development and join international clusters, connecting several countries. “After training in Dresden city in Germany for the first time a Lithuanian became an ESCA cluster benchmarking expert. Lithuania was provided a direct access to treasury of ESCA knowledge and experience” – claims the Director of the European Secretariat for Cluster Analysis Helmut Kergel.